And now the extras. The name "D. Dornblueth & Sohn, Kalbe i./S.A." 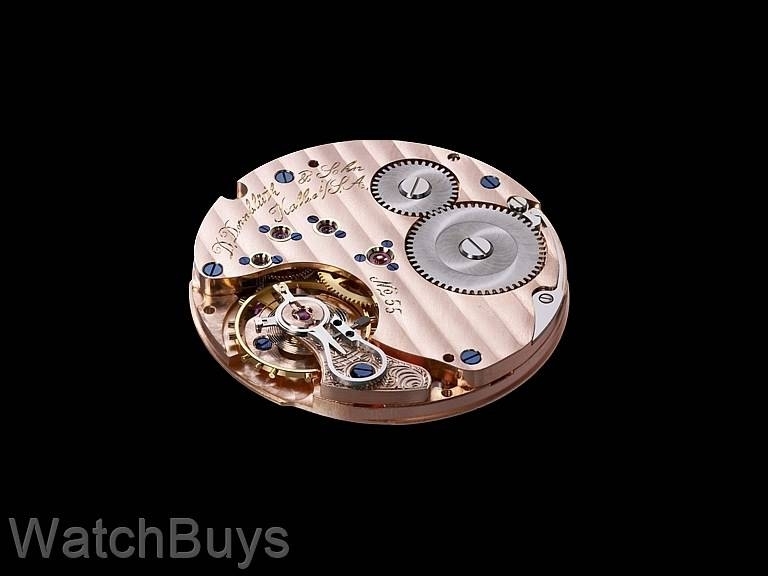 is hand engraved and not machine engraved, a virtual rarity on any watch. And all of the decoration (Côtes de Genève and the sunray finish on the crown wheel and ratchet) are all done in-house, by hand. 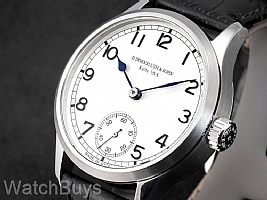 The dial is coated in silver, and is finished with black applied Arabic numerals and Glashutte "railroad track" markings around both the dial and subdial. Verified Owner Comments: I have wanted a Dornblueth for quite some time and was lucky enough to find the exact specification watch I would have ordered from the manufacturer on the Watchbuys website. The fact they had the watch in stock has allowed me to bypass the usual 9-12 month delivery time from Dornbleuth as almost all watches are only built when an order is received. From initial contact to final delivery of my watch the Watchbuys team (mainly Matt it has to be said) were superb to deal with and the watch arrived in perfect condition via the international courier as promised.